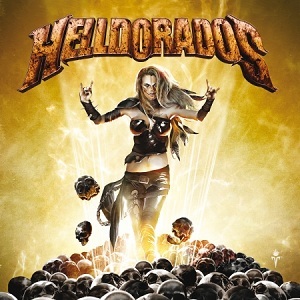 With the publication of the cover artwork and the whole tracklist Stuttgart’s sleaze metal band Helldorados are giving an insight look into their debut album that will be released July 13th. The internationally known artist and Unesco prize winner Timo Wuerz is responsible for the design. After just signing a worldwide recording contract with the traditional heavy metal label Massacre Records in March, Helldorades were able to win another high-quality partner: the artist and comic draftsman Timo Wuerz. “We have got to know Timo Wuerz by accident at an art and commerce congress. Between all of the geeks he looked more like us,“ claims Helldorados singer Pierre. At the same time they discovered many things they have in commonThe love for rock music and art. “Moreover, we both grew up in the same small town. That probably connects“ complements Pierre, smiling. At the age of 14 Timo Wuerz already had his first exhibition, at the age of 20he published his first album Aaron and Baruch. Today he lives in Hamburg and is responsible for dozens of comics and books,among others Marvel, and for the creation of films, shows, theme parks, architecture, stamps, toys, posters and CD covers. The works of the Unesco prizewinner can also be seen in international galleries and museums, for example in the museum of modern art, New York. From February to April Helldorados spent time in the famous Horus Sound Studios in Hannover to record their album. A total of 12 pieces of music were created for the self entitled album. It was produced under the direction of Mirko Hofmann who already took up the four songs strong promotional EP a year ago. ELOY frontman and founder of the Horus Sound Studios, Frank Bornemann, acted as “a godfather”.